No Rust – Polyethylene will never rust as it is impervious to almost any chemical. Durability – Polyethylene can handle the conditions of harsh transport environments. When you have a tank on the back of a truck there is chassis twisting, vibration, surge and much more. A poly tank will handle this for much longer than steel. Steel tanks are know to crack over time. Weight – Polyethylene is lighter than steel. This means you can increase the payload of your vehicle… So, use more of your carrying capacity for what counts – liquid! 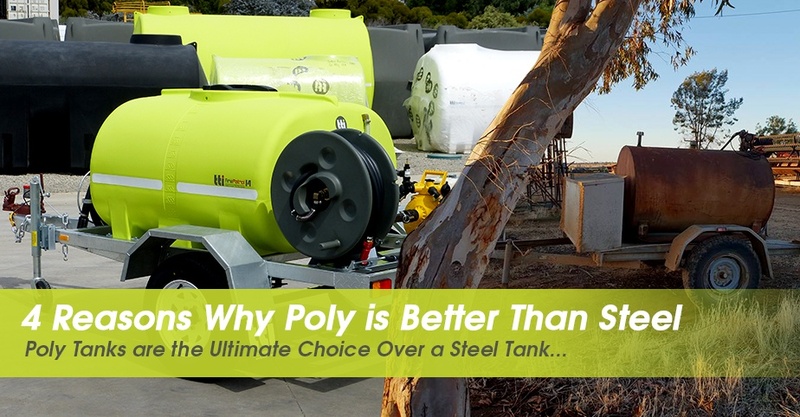 Ease of installation – Polyethylene tanks are typically a lot easier to install than steel tanks – Most TTi tanks come with loading legs to allow you to fix to your truck, trailer or UTE with ease.